Celebrate this Mother’s Day with a berry smoothie to make mom glow from the inside out. Mom deserves a morning off – which means you’ll be making breakfast. These recipes are vegan, healthy, filling and delicious. Everything your mom wants to feel her best on Mother’s Day. Anyone can make these quickly and easily, great for breakfast in bed. Of course, this smoothie is good for any day, not just holidays. With warmer weather upon us (hello +20 degrees last week) smoothies are both refreshing and satisfyingly healthy. This berry smoothie is rich in antioxidants and easy to blend up. Whether you’re serving breakfast in bed, or a brunch smoothies are great – feel free to add in or substitute other berries such as blackberries or blueberries. 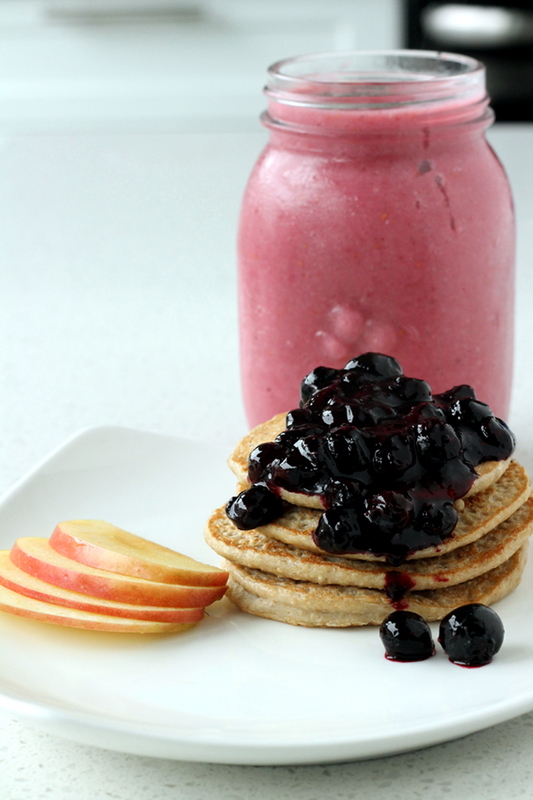 The pancakes and smoothie are both vegan, and wheat-free so mom will start the day off feeling right. You could also make mom this Orange Zested French Toast. 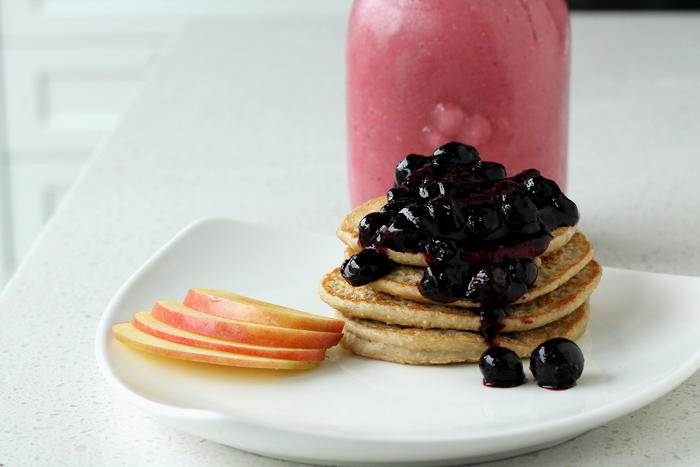 I paired the smoothie with the 3-ingredient Vegan Pancakes I shared before. Together the two make the perfect pair for a delicious breakfast. 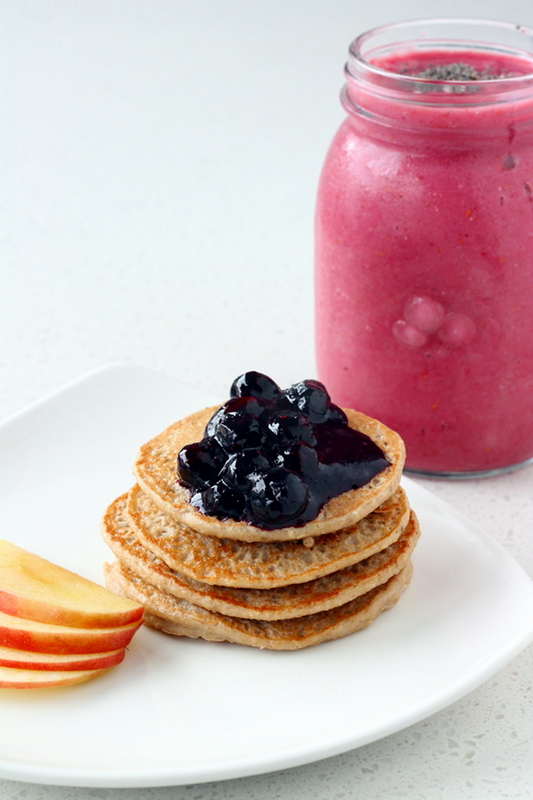 Top the pancakes with a delicious blueberry syrup and a side of fruit and you’re ready to go. 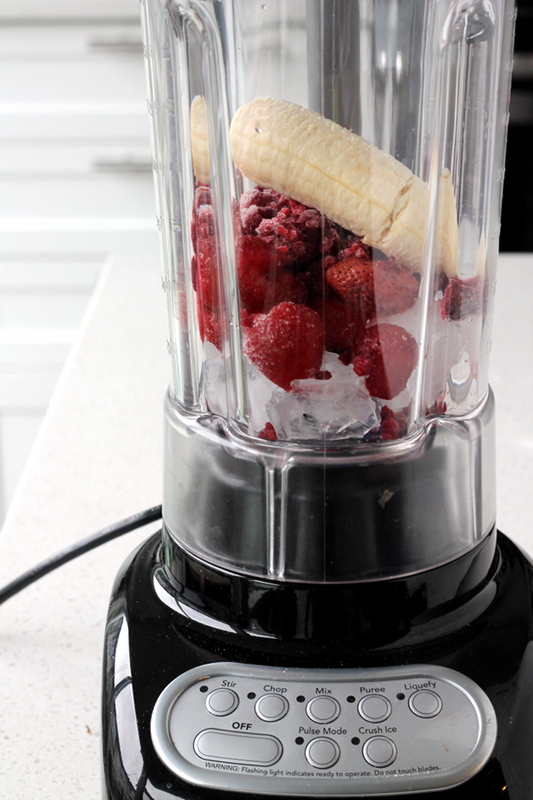 Add all ingredients to a high-speed blender and liquify/puree until well blended. If you find it is too thick, add more almond milk or a splash of orange juice/water to thin. Pour into large glass, sprinkle with chia seeds. Serve with a straw. Serve with 3-Ingredient Pancakes Recipe – pair with side of fruit such as apples, pears, or oranges. To make blueberry compote: microwave 1/2 cup frozen blueberries for 1-2 minutes. Allow to sit for a minute before serving to thicken.